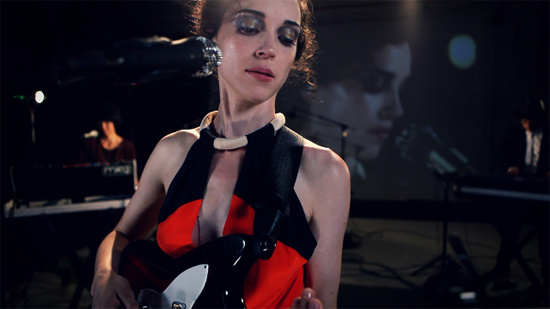 St Vincent has performed four songs from her new album Strange Mercy for the latest edition of the 4AD sessions. It's the first time she's recorded them live, and they more than do justice to their recorded counterparts. Watch the session here. In 4AD's words: "As with all of the sessions in the series, directors Iain Forsyth and Jane Pollard filmed the four tracks with a clear artistic vision. In this instance, the inspiration came from an unlikely source – the memory of seeing a 1968 Shirley Bassey performance of 'This is My Life' on Rai Uno for Italian TV. With that reference point in mind, Annie takes centre stage against the backdrop of a projected live-feed, resplendent in glamorous eye make-up and with her always-impressive guitar work brought clearly to the fore. More interestingly still, the classic showbusiness styling of the session is held in stark contrast to the affecting and darkly-tinged emotional undertones of 'Chloe In The Afternoon' and 'Surgeon', representing perfectly the themes that run throughout Strange Mercy." St Vincent tours the UK in November.